In OFDM system, I need to transmit a signal $x$ in SIMO channel $H$ of single Tx antenna and $4$ Rx antennas. The initial equation for that convolution is $r = Hx + n$ where $n$ is the noise. Below is the code, the issue is in the last line, how can I get the received signal $r$ in case if $H$ and $x$ don't have similar dimensions to do the matrices product operation? Your question is specific to how to do the convolution with a matrix multiplication in the case of a SIMO system. 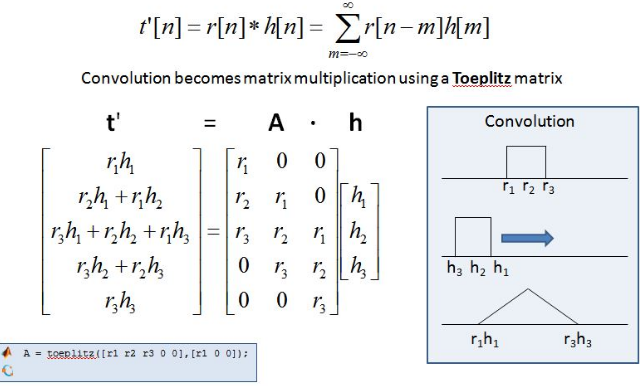 In your case "r" in the graphic is "x" in your code, and the Toeplitz Matrix A is formed by placing x in the column and shifting this along the diagonal over the number of columns given by your channel length (in your case 12). So if your transmit signal was 160 samples long and your channel 16 long, A would be a 175 x 16 matrix. As shown in the figure above, if you only had a single channel, the channel would be multiplied as a column vector resulting in the matrix product of 175x16 with 16x1 resulting in a solution as a column vector of 175 x 1. (Remember to do the matrix multiplication, the inside dimensions must match and the result will be the outside dimensions). For multiple channels as your case, simply multiply by the 16x4 channel matrix instead. This will result in 175x16 mulitplied with 16x4 resulting in a matrix result of 175 x 4, representing a column for each received signal. Not the answer you're looking for? Browse other questions tagged matlab convolution ofdm or ask your own question. Why Shannon Theorem has nothing to do with frequency? What is fft input size for ofdm?